The Husky GearBox® is perfect for storing loose items, reducing clutter and keeping your vehicle looking clean and organized. 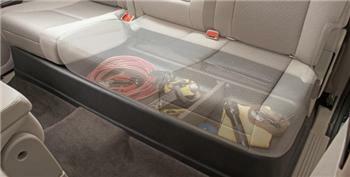 This unique storage system is engineered to specifically fit under your vehicle’s rear seats. Large capacity with removable dividers make it easy to store and organize both large and small items such as jumper cables, tools, car care supplies and whatever else you keep in your vehicle. The Husky GearBox® is manufactured using co-extruded materials consisting of a rigid durable substrate for strength and a soft impact-resistant surface that minimizes cargo shifting and provides noise reduction. A black textured finish gives the GearBox® a factory look. Husky GearBox®... custom interior vehicle storage for today’s most popular trucks. Designed and Manufactured in the USA with a Lifetime Guarantee against cracking or breaking.